Although Atiyeh continues to market traditional and transitional rugs, times have changed. 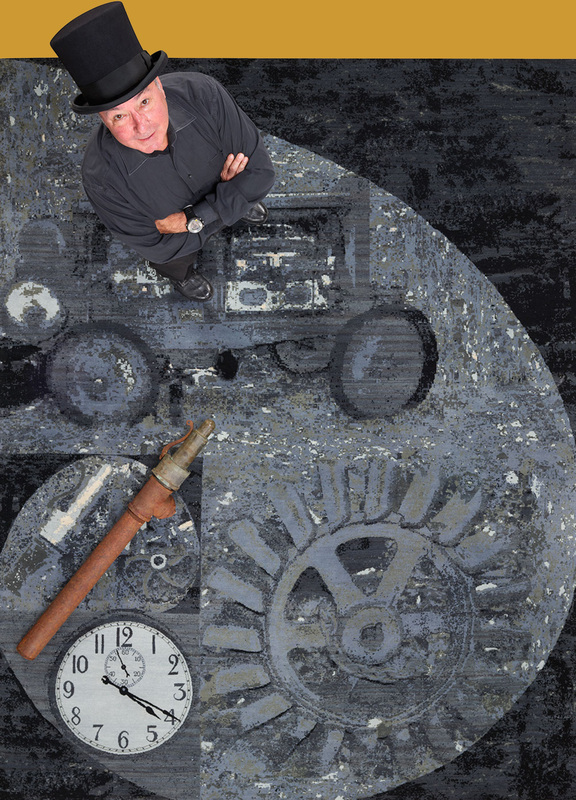 Atiyeh's entry into the modern rug market is inspired by Steampunk and connects the design flow with a Fibonacci sequence. The motifs are all existing relics of an Oregon mining town, Jawbone Flats - 1920s air compressor, 1880s cast iron water wheel, pressure relief steam valve and the iconic clock ticking down to 4:20. Get it? The Atiyeh family has been in the rug business for 116 years and continues with changing world conditions. Tom Atiyeh spent the last eight years assisting Oregon nonprofit organizations including Opal Creek Ancient Forest Center that teaches environmental education from his maternal grandfather's mining town, Jawbone Flats. Tom revisited the rug markets in the US and India and decided to produce a unique high quality "modern" rug with flair of history and authenticity.